Ome of the best Fantasy writers out there, period. Great books, just great. 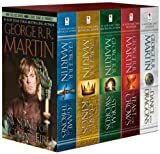 I read all four books in one rush and was really disappointed when I found out that there was no fifth book to the series. I searched quite some time for further books to the series, but apparently Brandon Sanderson has given up upon the series. I can't recall any scenes that bored me and the story itself is also quite good. I really recommend reading the Mistborn novels. A decent series, but way too highly ranked IMHO. The writing style is great, and the plot development is solid, but I never really found myself thinking "this world is AMAZING" like I have in some other series (ie. WOT or ASoIaF or even The Night Angel Trilogy). Decent read though, and a solid author. I look forward to his new series, and commend him for doing an amazing job so far finishing up WOT). This series caught me off guard. Mistborn being my first experience reading Brandon Sanderson, my mind was blown. The characters are interesting, the narrative tight and the action scenes quite satisfying. There are definite moments where things drag a little as the author builds builds up the tension and it works most of the time. The Epilogue wrapped things up perfectly as well. Okay, I love this book. Mistborn (in my opinion) is brilliant. It has a solid, interesting and intuitive magic system, mixed with a fascinating world. Okay, maybe it's plot is not that original (Brandon himself says his characters are archetypical), but it's still extremely well done and the characters feel real despite being pretty big tropes. It's just a ton of fun. My suggestion is that you should really, really read this if you want to see a good solid magic system not just done well, but excellently. It gives the world more depth. Well, it's not that bad, but it's not that good either. Some characters are interesting, though a little static, others are rushed away and I couldn't remember much about them as I was reading. And there are a lot of boring pages with people pushing and pulling coins, jumping left and right that I could do without. The magic system has little magic in it, and the plot is plain. As you can see, it was not my cup of tea, but it has its strength and could definetely please other readers. I just don't get it. Terrible writing of women, no romance whatsoever, flat and uninteresting. Why do people like this? I found this book plain, the one female character was meant to be a main character but had little autonomy and a very bland personality. The men in her life make most of her decisions and she spends half her time picking out dresses and having boring conversations with dull people. The magic system is unusual but thatâ€™s about as positive as I can get.